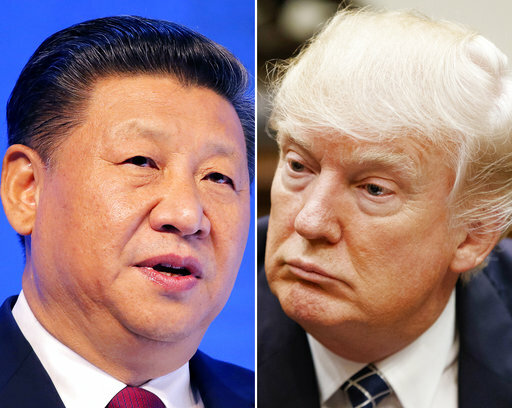 BEIJING (AP) — U.S. President Donald Trump will meet with his Chinese counterpart Xi Jinping for the first time on April 6-7 at Trump’s Florida resort, China’s Foreign Ministry announced Thursday, amid a range of pressing issues including trade, North Korea and territorial disputes in the South China Sea. The relationship between the world’s No. 1 and No. 2 economies has been uncertain following the election of Trump, who accused China during his campaign of unfair trade practices and threatened to raise import taxes on Chinese goods and declare Beijing a currency manipulator. It is unclear whether Trump will follow through with either threat. He is now seeking Beijing’s help in pressuring North Korea over its nuclear weapons and missiles programs. China is North Korea’s most important source of diplomatic support and economic assistance. In February, Trump reaffirmed Washington’s long-standing “one China” policy in a call with Xi, in an apparent move to ease concerns in China that he might use Taiwan as leverage in negotiations over trade, security and other sensitive issues. The policy in place since 1979 requires Washington to maintain only unofficial ties with Taiwan, which China claims as its own territory. A statement from the White House said the two leaders will discuss global, regional and bilateral issues of mutual concern. President Trump and first lady Melania Trump will host Xi and his wife Peng Liyuan at a dinner on Thursday evening, it added. Chinese Foreign Ministry spokesman Lu Kang told reporters that Xi would meet with Trump at Mar-a-Lago, without providing any more details. It is the same Florida resort where Trump hosted and played golf with Japanese Prime Minister Shinzo Abe in February. Xi, a fan of soccer and other sports, is not known to play golf. Before arriving in the U.S., Xi will pay a state visit to Finland on April 4-6, Lu said. Relations between China and the U.S. under former President Barack Obama were strained by issues including China’s island-building in waters surrounding international shipping lanes in the South China Sea, allegations of cyberhacking and a U.S. policy rebalance to Asia. Despite that, cooperation between their militaries expanded tentatively, and China’s defense ministry on Thursday hailed further growth, while warning of potential frictions ahead. “We are willing to make joint efforts with the U.S. side … so as to maintain a stable military-to-military relationship while striving to make new gains,” spokesman Col. Wu Qian said. However, Wu also reiterated China’s opposition to the deployment of a sophisticated missile defense system in South Korea, known as THAAD, which Beijing says threatens its own security with its ability to monitor flights and missile launches deep inside northeastern China. “The deployment of the THAAD system will definitely not make (South Korea) any safer. And secondly, the Chinese military’s opposition to the THAAD system will definitely not be confined to just words,” Wu said. One bright spot touted by both sides under Obama was the two nations’ cooperation, as the world’s top emitters of greenhouse gases, on tackling climate change. Lu said Wednesday that China would stick to its climate commitments after Trump, who has called climate change a hoax, this week rescinded measures enacted by Obama to reduce coal and oil use.